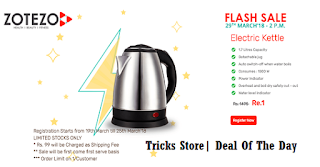 Flash sale trick, New 1 rupee sale, free shopping offer, ZOTEZO FLASH SALE at Rs1 – Hello guys, New 1 rupee summer is coming where you can get Electric Kettle at Rs 1. This sale is organised by ZOTEZO.com . This 1 rupee FLASH SALE Registration already started from 19th march and is still going on till 25th march. So guys don’t miss out the free deal & Register on ZOTEZO Flash Sale Web Page and buy Electric Kettle at 1 rs. You can also check out the Free Recharge Tricks and Free Recharge apps to get more benefits. The Zotezo rs 1 Flash sale will live on 29 March 2018 at 2PM on Zotezo Official Website (zotezo.com). You can book Rs 1 kettle on there website. But there are some small delivery charges which you have to pay, but the charge is just Rs 99 only. Only one person can book one Kettle one time. And i sure that the sale is genuine. We also alert you about Droom Flash Sale. Hope you enjoyed it too. And this 1 rupee sale will going similar to that. So guys let’s try your luck because stock is limited go fast. 1. Firstly Check out the – ZOTEZO OFFER FLASH SALE PAGE . 3. Now here enter Your Name, Mobile Number, Email, and Password etc. 4. That’s it guys now you have to wait for the ZOTEZO Flash Sale. Tricks Store Tip – Please do login or registration before the sale day & ensure that come online before the sale time because sale is based on first come first serve basis. * Zotezo 1 rupee sale starts on 29 March 2018 @ 02:00 P.M.
* Registration opens till 25 March 2018. * Need to pay extra delivery charges of Rs 99. * The sale will be first come first serve basis. 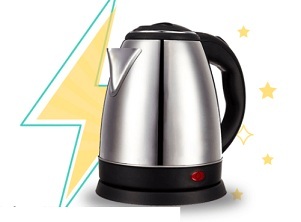 * One customer can buy only one Kettle @ one time in this Flash sale. Read More Flash Sale T & C.